The new building of Schulz and Schulz Architekten (Leipzig) is divided into a community center with a bell tower, church room and vicarage. The facade is designed throughout with light red volcanic rock. 1,500 tonnes of porphyry from nearby Rochlitz was installed and horizontally stacked above the support structure made of reinforced concrete and the insulating layer of foam glass. There are two main parts to the ensemble - the tower with the adjoining two-storey community center and the church space. They are connected via two bridges upstairs and opens up to the city as a central meeting place. 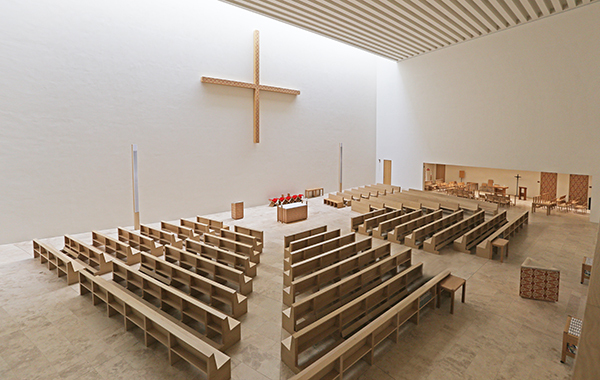 The 640 square meter church space is not just for parishioners – it offers a "space of silence" in the hectic inner city for all of Leipzig. 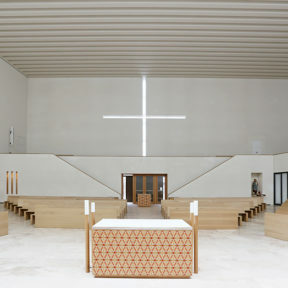 Directly above the altar, the architects have integrated a large opening for natural light into the ceiling. Here, the room is limited in 22 meters height by a band of skylights or rather opened. The incidental daylight stages the altar and gives the entire room an extraordinary atmosphere. The 22-meter-long and 3-meter-high, ground-level church window opens and limits the church space opposite the city centre. It is a place that impresses. 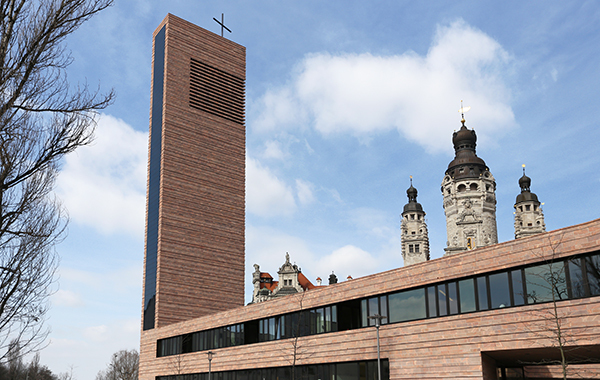 Since its opening in May 2015, St. Trinitatis has received numerous awards - such as the "Nike" from the Bund Deutscher Architekten and the "Religious Building of the Year" at the World Architecture Festival 2016. The new building also received the 2016 Balthasar Neumann Prize Baukultur quality honours for outstanding interdisciplinary cooperation in the field of architecture (Schulz and Schulz), supporting structure (Seeberger Friedl) and energy / sustainability (ee concept) and technical building equipment (MLT Medien Licht Technik Ingenieure). 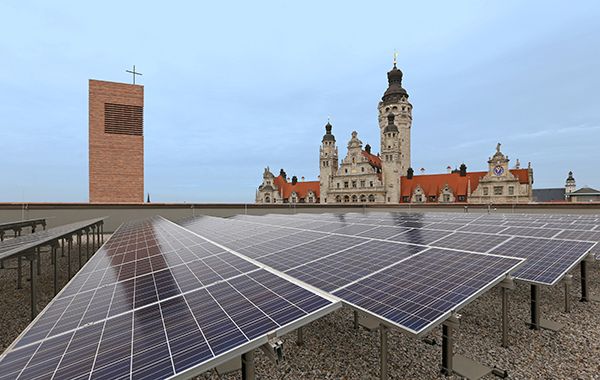 Because St. Trinitatis is currently considered the most sustainable new church in Germany. 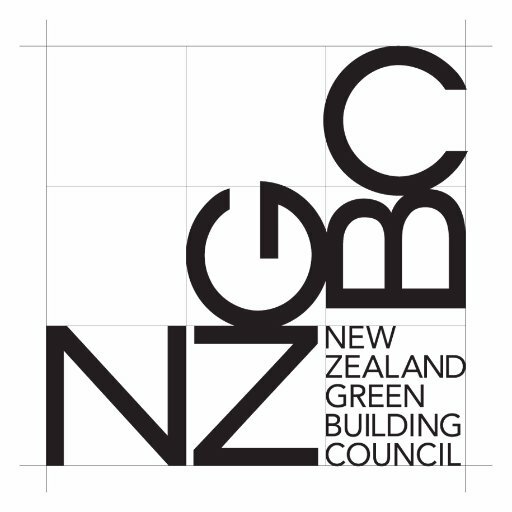 A look into the concept of sustainability: It was an important concern of the community to implement the Christian mission for the preservation of the creation in the sense of a sustainable building from the architectural competition through the construction phase to the operation of the building. 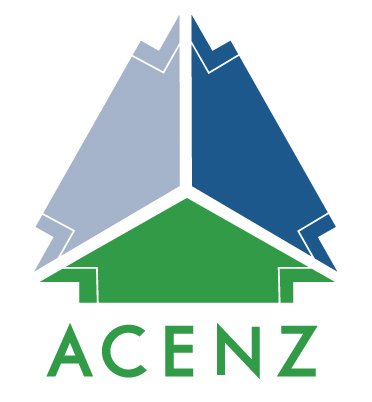 All components are significantly more insulated than the statutory minimum requirements demand, largely pollutant-free and made of durable, mineral and renewable materials. 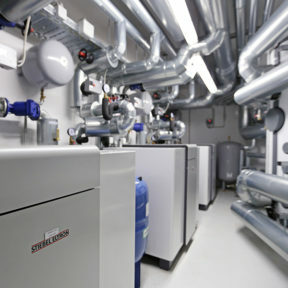 In addition, St. Trinitatis proves that geothermal energy is also an attractive alternative to district heating for larger buildings in the city center. "Leipzig city center is district heating area. However, the municipality wanted to be as self-sufficient in terms of energy as possible and focus entirely on renewable energies, "explains Torsten Hauke from the responsible TGA planning office MLT. 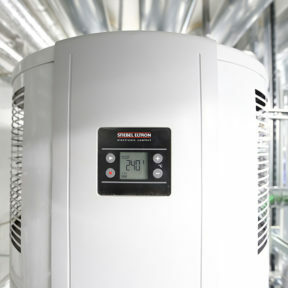 Three STIEBEL ELTRON ground source heat pumps (WPF 52) were used to extract the heat for building heating from 18 soil probes 140 meters deep and 100 meters deep via a geothermal probe. As the pumps work more efficiently, the lower the temperature difference between the soil and the heating temperature, a floor heating with a correspondingly low flow temperature distributes the heat. In summer, the building is also passively cooled by the system: the heat from the building is released via the probes into the earth, which in turn benefits the regeneration of the probe system. 40 per cent of the electricity is from solar energy. The total output of the solar system is 54 kWp. In the church tower, rainwater is also collected in a 29,000-liter tank and sent by gravity to the demand points in the toilet areas in the building. Since September 2017, church bells ring again in the Propsteikirche - a symbol of the contemporary sense of responsibility of a church of the third millennium.